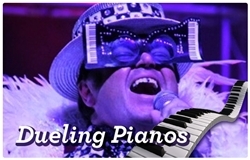 Hailing from Boston, MA, Bill Connors has created the world’s most authentic recreation of Elton John (tributeeltonjohn.com.) Todd “The Piano Man” Cutshaw is a member of the Piano Maniacs from Ohio. Coming as a group? Please call 716.355.4141 for reservations and table assignments. Cash bar & limited menu.